I admire anyone who can commit to writing these 31 days, Joy. Please do take care of yourself though, ok? I know how easily your body wears out, so please don’t ignore the signs either. Rest when you need to. You will still be carried on the cloud of grace. 🙂 I have learned that when I don’t get enough physical rest, I can get discouraged more easily. 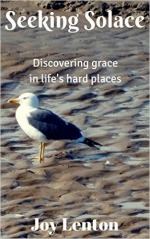 I especially love this – “Whatever is troubling your soul, let it be, my friend, and let God be who He wants to be in your life: a rock-steady Hope, a force for Good, an Anchor to hold you firm, a sea of Grace, a river of Peace, a Saviour and your closest Friend, and so much more than we can ever imagine.” Thank you for this hope-filled encouragement! I remember hearing that Beatles song as a child. We didn’t have a TV, but we did have a record player. 🙂 Love and hugs to you! Trudy, it is a huge commitment and an act of faith to complete this series, especially when we have a start point of weakness and fatigue. I definitely couldn’t even contemplate this challenge if I didn’t believe that God had called me to do it and would inspire, energise, strengthen and sustain me through it. But you’re quite right. Taking care of myself is a high priority. That’s why I am quiet elsewhere and cannot always manage visiting other blogs. I am resting as much as possible, carried on that cloud of grace, grateful for the opportunity to write each day, and hopefully bless others along the way! Oh, this sentence touches my heart so much: “Here’s the thing. I want to go out on a cloud of grace. Same way as I came in, in fact.” This reminded me of Job’s utterance: “naked I came from my mother’s womb, and naked I will return.” And of course, we feel the negative hurt of that. But what if that way of seeing is a freeing Grace? Letting all go to the Lord, and then embracing HIS GRACE as the true sustaining Love under everything? What a beautiful way of living that I want to walk in as well, my friend. Thank you for sharing these encouraging words, even as you are so weary yourself. May the Lord grant you the full strength you need for these days. Much Love and Hugs! “I want to surrender to God most of all, hard as it can be sometimes.” The crux of it all. Thank you for the past 24 entries, freely offered from a 24 carat gold heart. Oh, Joy, I want to do that, too. I want to not wallow in sadness or pain, but trust in God and let Him hold me. And your haiku says it all – joy, love and peace. And I love the Beatles song! Thanks for sharing. It’s a daily challenge to deliberately let love, joy and peace define our attitude, rather than giving in to dismay and discouragement. Thankfully, God finds a way of helping us to meet our Holy Spirit inspired desires. So blessed to have you share these heart hopes too, Gayl! Letting God hold us, as we trust the changing process to Him, is key to seeing it come to pass in our minds and hearts. Surrendering can be oh so hard. But is so worth it! Indeed, Joy ❤️❤️ Very timely for this Padre in need of a retreat that is coming next week! Thank you for these encouraging words, friend. The fatigue is still such a new burden for me that it often discourages. Your words help. Thank you. Praying for you to finish strong, dear one.